Over time little known plants were often targeted as miraculous cures for one thing or another. Skullcap is one of them. For some time it was publicized as the only cure for rabies, rabies in people, of course, not in animals. It went by the name of maddog weed when I was small, and it seemed that every summer a new supply of its miracle cure was hastily made to insure the well being of those who might have come in contact with rabid animals. There was a time that I was so young I can barely remember, when a rabies scare turned normal parents upside down. When I think of it, I call it the summer for rabies. I remember only bits and pieces of that summer since I was not quite 5, but it was not a happy time. My dog Pepper, who was approximately my age, had her first litter of puppies. I only remember naming one of them Sandy and it was to be a pet for my uncle and his new wife. There were not many dogs in my life at that time, only Pepper, and she was a beautiful mixed breed of something or other. Long white hair that glistened and a personality that could easily win the coldest heart, that was my Pepper. Word got around that a rabid raccoon had come close to homes where children were playing in the yard; then we heard that squirrels, opossums, rabbits, and finally my Uncle Dock’s beautiful collie, Shep, had to be put down because of the dreaded rabies. When that happened, dogs were put on a makeshift chain and contained within a fenced area, or they were put in an inside area where no other animals could get to them. Pepper was given living quarters in a toolroom just off the back porch. I breathed a sigh of relief because she was safe. 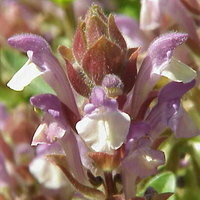 Publicized as a cure for rabies, Scutellaria lateriflora caused a stir during the mid 18th century. One doctor announced at the time that he had successfully treated hundreds of cases with it. 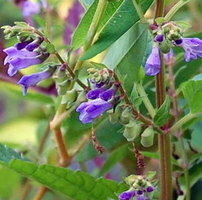 His claims for skullcap were finally discredited, but not before earning the plant more common names referring to its association with rabies: madweed and mad dog weed. It grows in moist woods and swampy areas, and as a native North American plant, can be found across the country. It is a perennial with an erect, smooth branching stem that grows to 3 feet. Broadly lance shaped, toothed leaves grow in opposite pairs. Small tubular blue, pinkish, violet or white flowers bloom in July and August. The blooms have two lips, the upper one is hooded. The name of the plant, skullcap, refers to the shape of the flower, which resembles a helmet with the visor raised. Skullcap was the word for a type of military helmet that was familiar to earlier colonists. The Indian tribes used it as a sedative, and there were at one time claims for it’s effectiveness as a “nervine” or tranquilizer. It has achieved a reputation as a sedative and antispasmodic, properties that may account for its sometimes being effective in alleviating the symptoms of rabies. For years herbalists have acclaimed the plant as an excellent “nervine”, and have prescribed it for a gamut of so called nervous disorders from mild anxiety to epilepsy. That achieved some controversy, but less controversial is the calming effect of the tea made from the whole plant. Skullcap contains scutellarin a flavonoid with sedative and antispasmodic properties. This was probably the active ingredient in the skullcap extract used in 19th century medicine. It is still used in modern herbal medicine for the prevention of epileptic seizures, insomnia, hysteria, anxiety and withdrawal from barbituates. It is currently an alternative herbal medicine to treat HDD. More cautious pharmacological opinion concedes as possible the validity of skullcap’s use as a sedative, but only on the basis of animal tests. It is one of those plants that should not be used as a home remedy in any instance, the plant has some effect on the nervous system, and as such should be considered too dangerous to be used in any way without the attention of trained medical personnel. The summer for rabies is only a dim, distant memory, and not a very pleasant one at that. Dogs and cats were being put down for no reason other than folks had no place to keep them contained. Somehow I lost the puppy, Sandy, perhaps as a precaution, but my Pepper dog was spared at a time when many animals were not. People were worried, and children were not allowed to roam freely that year. And bottles of skullcap infusion lined many kitchen cabinets. That’s the way of things sometimes, we have to survive a scare to make us more aware, more cautious. It has always bothered me that so many animals were wiped out simply as a precaution. But there again, veterinarians were unheard of in the mountains, and fathers simply did what they had to do to protect their families.